Obsessed with Pakistan, India has grossly neglected the real adversary. 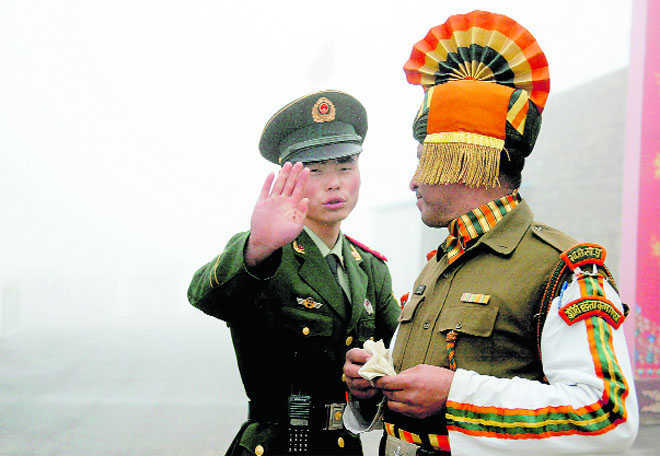 In point-to-point skirmishes and standoffs, battle- hardened Indian soldiers will deter, if not defeat, the PLA. However, across a broad front spectrum in an unlikely all-out war, it is advantage China. At a time when China is threatening to teach India another lesson and warning not to engage in a two-front conflict over the standoff in Doklam, our Service Chiefs, it seems, are not on the same page about fighting a two-front war especially as Beijing might try to emulate the New Delhi-Thimpu alliance in "disputed territory" with one with Islamabad in PoK. While General Bipin Rawat has more than once asserted the Army's preparedness for a two-front war, Air Chief Marshal BS Dhanoa has highlighted the critical shortfall in the number of fighter squadrons — 32 against the required 42 squadrons — to dominate a two-front conflict, saying: “It is akin to a cricket team playing with seven players instead of 11”. The deficiency in air assets has existed for decades but this is the first time an Air Chief has related it to a two-front war. The Chief of Naval Staff, Sunil Lanba, when asked about the disparity in preparedness of the services, said: “The way national security is being handled is not commensurate with the security environment which is extremely serious at the moment”. Recently, Gen Rawat told a military audience that the military was not getting enough funds for modernisation — repeated ad nauseum by every Chief — due to the perception that expenditure on defence is a burden on the economy. This set the cat among the pigeons as Finance Minister Arun Jaitley, a regular fill-in for Defence Minister, is believed to have told Gen Rawat: “Don't worry about funds. When you run out, call me”. In the mid-1990s, when the Naval Shipyard order books had gone dry, CNS, admiral Vijay Shekhawat went public about the Navy's operational deficiencies, prompting Defence Minister Mulayam Singh Yadav to invite him to discuss dwindling fleet numbers. Ad hocism has become the hallmark of modernisation of the military. The Chinese are constantly reminding India about the power differential — military, economic and infrastructural — between them. Being obsessed with Pakistan, India has grossly neglected the real adversary. The reason for this is the institutionalised absence of strategic thinking and higher political direction of war and conflict in the face of growing threats and challenges to internal and external security. Prime Minister Modi's boast about big defence reforms is hollow: had he been serious about defence, he would have named a full-time Defence Minister. The appointment of a Chief of Defence Staff has not overcome the hesitation of history — read bureaucracy. The country has never produced a “Defence White Paper” or done a “Strategic Defence and Security” review. Something called the “Raksha Mantri's Directive” masquerades as higher political direction on deterrence and war. This bit of literature drafted by the military has its origin in 1983, with periodic face-lifts to make it contemporary. Are we surprised that while President Xi Jinping who heads the Central Military Commission, has personally ordered and supervised the reorganisation of the combat formations facing India, reducing them from three commands to one command — a single Western Theatre Command headed by the powerful Gen Xhao Zongqi — the China front in India is managed by four Army and three Air commands deployed at seven locations. A forward-looking proposal made by a defence committee recommending three integrated operational commands — North, West and South instead of 17 single service commands — was shot out of hand by (no guesses) the Air Force. The CDS and accompanying Joint Staff ordered by the UK in 1984 was a fait accompli. It was introduced by a political class which understood defence and strategic security. In India, countless defence reforms are languishing for want of decision making. It is instructive to recall how the two-front strategy was formally enunciated in December 2009 by the Army Chief Gen Deepak Kapoor. It followed the 2008 Mumbai terrorist attack, after Prime Minister Manmohan Singh ordered the Service Chiefs to prepare for war. Defence Minister AK Antony then had “preparation for a two-front war” added in his Directive but did little to implement it. Both in 1965 and 1971 wars with Pakistan despite the collusive threat from China, there was no cross-border intervention by China though sizeable formations of the Eastern Command remained deployed against it and forces could not be switched to the west or east for fighting in East Pakistan in 1971. In a real two-front war, swing forces in east and west will not be able to reinforce either front and only dedicated formations will fight the war. Given the paucity in current force levels, inadequate sophistry of combat support and terrain and infrastructure handicaps, it will be an uphill task to match the PLA's strength and versatility across a 3,488-km front of undefined borders. In point-to-point skirmishes and standoffs, battle-hardened Indian soldiers will deter if not defeat the PLA. Across a broad front spectrum in an unlikely all-out war, it is advantage China unless India is prepared to rethink its “no first use” nuclear doctrine. As an offset in the western front, Gen Rawat has suggested creating a two-front situation for Pakistan: either in Afghanistan or Iran. Doklam may go the 1986 Sumdorong Chu way; the 10-month-long standoff challenging the Chinese intrusion at Thandrong, west of Tawang over the interpretation of watershed, without a shot being fired. India need not invoke its doubtful capacity to fight a two-front war; instead, speedily augment its deterrence against China. This may not win votes for Modi but it will prevent Chinese pinpricks that he famously called "toothache". The writer is the founder-member of the Defence Planning Staff.